Hemp seeds are a whole food that deliver an incredible amount of nutritional punch (summarised below)! Protein – Hemp protein IS COMPLETE (meaning it contains all 20 amino acids, including the 9 essential ones). This is extremely rare for a plant-based food, making it an ideal choice for vegetarians and vegans. 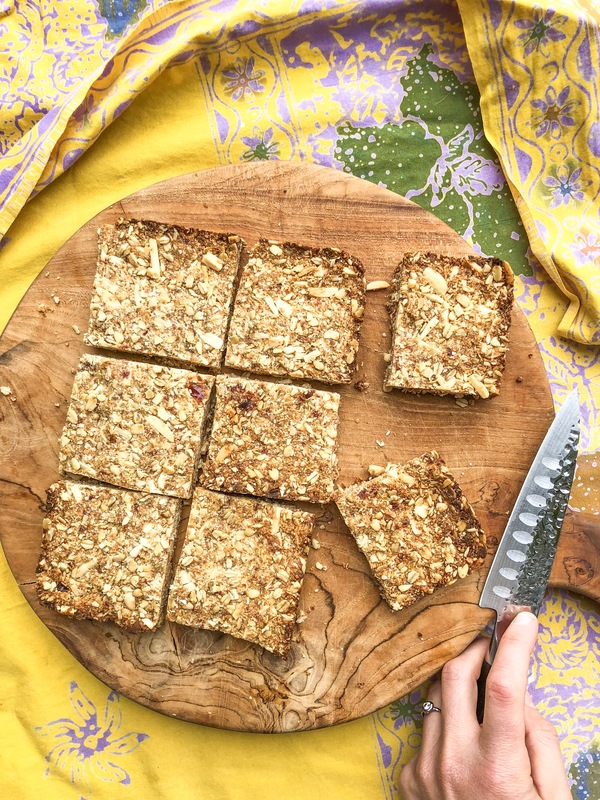 Hemp is also a wonderful source of branch-chained amino acids, needed for repair and growth of lean body tissue (making these protein bars an ideal post-workout snack!). Essential Fatty Acids – The essential fatty acid ratio (omega-3 and omega-6) in hemp seeds is ideal at 3:1. Hemp also has gamma linolenic acid (GLA), which is extremely hard to find in other food sources! Fiber – Hemp is a great source of healthy carbohydrates and dietary fiber which helps stabilise blood glucose (sugar) levels, and helps promote healthy bowel movements through the day. Vitamins & minerals – Hemp is also a wonderful source of Vitamins A, B1, B3, B5, D, and E. It is also a great source of iron (very important for those following a vegan/vegetarian diet – read more about that here) and provides about 48% of your recommended daily intake of magnesium (100-200 mg per tablespoon). Preheat oven to 180 degrees celsius – add oats and almonds to baking tray & bake for 10 minutes until LIGHTLY toasted (not completely brown – just slightly golden). Add flaxseed meal, desiccated coconut, and sea salt to a mixing bowl and stir through. Add oats/almond mix and hemp seeds to mixing bowl along with chopped dates – stir this mix through. Add almond butter, coco oil, tahini and maple syrup to a small saucepan and bring to a low boil – stirring occasionally. Add to the mix immediately. Mix thoroughly, ensure it coats all of the dry ingredients. Add the mixture to a baking tray (lined with baking paper) and spread into an even layer. Press down with something flat (like the bottom of a cup). Bake at 160 degrees celsius for 25 minutes (until the edges are brown). Remove tray and put in the freezer. Once cooled, take the mixture from the pan and slice into the number of bars that you want! Previous What type of bread is the healthiest to eat? Next Can changing your diet help with PCOS?